The last time that the Fredonia Blue Devils played the Potsdam Bears in January, Rick Rivera was in attendance. His wife, Dana, was in attendance as well. The two were there as parents paying support to their kids, which is nothing out of the ordinary in the world of sports. What is out of the ordinary is that the two had flown in from their home in [Pacific Palisades] Los Angeles within 24 hours of the puck drop. More extraordinary is the fact that it was only the second time they were in such a scenario, watching their sons compete as opponents rather than as teammates. At the time, the younger of the two, Luke, was a freshman here at Fredonia. The eldest brother, Jake, was a senior at Potsdam. Each was donning the number 23. The brothers had essentially grown up on the ice; Jake began playing hockey at age 5, Luke at age 3. In their combined four decades playing the sport, this was only their second time matched up against one another in a competitive setting. Faced with the moral dilemma of neutrality, their father never plans to reveal who he was rooting for on that night in January. Palisadian Dana Rivera, a stroke survivor and Danny Kubear, a 5-time stroke survivor from Fredo, New York, dropped the puck to start the match. “We showed up and sat at center ice,” said Rick Rivera. “I sat with the left foot on one side, right foot on one side, and watched. “As for who I was cheering for on the inside, well, I’m probably best off taking that one to the grave,” he concluded with a chuckle. That meeting between the brothers Rivera ended up with Luke’s side winning to even the series between brothers at 1-1. Fast forward to Friday night. The Rivera clan was back in town for another meeting between Fredonia and Potsdam. This game only featured one of their sons—Jake having graduated last year—but the game was still just as significant to the family. The end result of Friday night’s game was a 4-1 victory for Fredonia, but the story of Friday transcends all action on the ice. Friday was stroke awareness night for the Blue Devils, the first event of its kind to take place in the Steele Hall ice arena. The fundraiser was thought of and driven by none other than Luke Rivera, who was instrumental in orchestrating the event. Similar to the annual “Pink the Rink” game, the game featured unique jerseys for the Blue Devils. These in particular were red and white with a digital camo pattern, the camo to pay homage to Veterans Day, which coincided with Friday’s game. The jerseys were a group effort in designing, headed by Marcus Ortiz, Hunter Long and Luke Rivera. The thought of having a stroke awareness game was of personal accord to Luke after Dana suffered multiple strokes on June 29, 2009. “I know people affected by this, mainly my mom, and you just don’t see the exposure to [strokes and stroke awareness] like you do with breast cancer and other stuff like that,” said Luke Rivera. Two strokes within one hour left half of Dana’s body entirely paralyzed. The strokes came as a shock to the family, who never imagined such a health lapse occurring to someone who maintains a physical standard as high as Dana’s. The stroke was an apparent result of a patent foramen ovale (PFO), or a hole in Dana’s heart. As many as 20 percent of Americans carry this trait, but most go unaware aware of the condition. In rare cases, however, a PFO can cause a stroke by allowing clots into the bloodstream of the body. After the strokes and her diagnosis, Dana underwent surgery to correct the problem and has been spreading awareness of the issue ever since. Due to her physical conditioning and work ethic, Dana’s recovery from the stroke was remarkable. For the human body to overcome something like paralysis to one side, a lot of re-learning has to take place. This occurs through the brain’s neuroplasticity, or its ability for each hemisphere of the brain to learn the duties of the other. In extreme cases, such as Dana’s, all facets and actions of everyday life need to be re-learned by the opposite side of the brain. Dana and Rick Rivera with son Luke, who plays for the Fredonia Blue Devils. Although hard times fell on the Riveras in the immediate aftermath of Dana’s strokes, the family had a positive outlook in the months following. As of game time on Friday, donations toward the stroke awareness event approached $8,600. Donations came in a variety of forms, ranging from a GoFundMe page to sales of stroke awareness bracelets. A good majority of that was orchestrated by none other than Dana’s mother and Luke’s grandmother, Arlene Bachner. “My grandma has actually been really important with regard to how much money she’s raised,” said Luke Rivera. In total, he estimated that $7,000 of the $8,600 raised before Friday was facilitated by his grandmother and her contacts all over Los Angeles. “I just thought about how at events you usually have someone do the opening pitch or coin toss. I thought, ‘Why not do a puck drop?’ and we went with it,” said Luke Rivera. In addition to the GoFundMe page, ticket sales, bracelet sales and other donations, Friday’s game featured a silent auction and a 50-50 raffle. The totals in money raised peaked at more than $9,000. 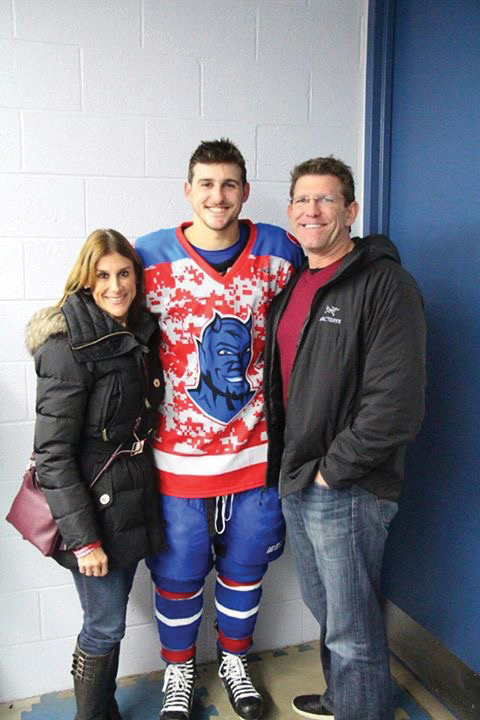 The 4-1 victory over Potsdam capped off a perfect event for the Blue Devils and the entire Rivera family. “There’s no secret about who I’m cheering for tonight,” said Rick Rivera prior to Friday’s game. It’s safe to say that he, along with most other Blue Devils, left Steele Hall on Friday night entirely satisfied.